The Trump administration is working to overthrow the government of Venezuela. They are not at this time doing this by military invasion, nor by funneling thousands of armed militants into the country, nor even solely with starvation sanctions and CIA ops. The first and foremost means of overthrowing Venezuela’s government currently being utilized by the United States government is the low-risk, low-cost plan to simply control the stories that everyone tells themselves about who is in charge in Venezuela. Adept manipulators understand that humans are storytelling animals. The only thing keeping the powerful powerful, keeping money operating the way it operates, and keeping government running the way it runs is the stories we all agree to tell each other about those things. If everyone collectively decided today that poker chips are the new currency and Kim Kardashian is the Supreme Ruler of the Entire World, those stories would be the new reality, and tomorrow we’d all be doing whatever Empress Kim commands and Las Vegas would be the new Wall Street. The Trump administration is exploiting this exact principle in Venezuela by singling out some guy named Juan and calling him Mister President, despite the fact that he’s never received a single vote for that office and holds no actual power. If they can persuade enough Venezuelans (particularly the ones with the big guns) and the rest of the world’s governments to do the same, then Guaido will indeed become the functional president of the country. Everything the Trump administration does to Venezuela is done with the goal of controlling the stories people tell about it. They smash the country with starvation sanctions, then tell everyone to believe that Maduro is starving his people. They stage a “humanitarian aid” stunt on Venezuela’s border, then they lie and tell everyone that Maduro is blocking all aid to Venezuela and setting aid trucks on fire, because he wants to starve the hungry and kill the sick. It’s all about controlling the narrative with the goal of changing who is recognized as the legitimate president of Venezuela. ABRAMS: As to the Venezuelan constitution, the National Assembly has passed a resolution that states that that 30-day period of interim presidency will not start ending or counting until the day Nicolas Maduro leaves power. So the 30 days doesn’t start now, it starts after Maduro. And they — that’s a resolution of the National Assembly. ABRAMS: They did that — this is roughly a month ago. We could try to find the date for you. QUESTION: When he was — when he was — took the mantle of interim president, that wasn’t there. QUESTION: Can you do that ex post facto like that? QUESTION: That seems to be like saying I was elected for four years to be president, and then two years in you change the rules so that your term didn’t start — hasn’t even started yet. How does that happen? ABRAMS: Well, you don’t get a vote because you’re not in the National Assembly. QUESTION: Well, you don’t. You’re not in the National Assembly either. QUESTION: If it matters, does the U.S. view that as constitutional under their system? MR ABRAMS: Yes. I mean, we’re taking the — the National Assembly is the only legitimate democratic institution left in Venezuela, and their interpretation of the constitution, as you know, is that as of the date of this alleged term for Maduro, the presidency is vacant. But they have also said that that 30-day period starts when Maduro goes. QUESTION: So Juan Guaido is the interim president of an interim that doesn’t exist yet? MR ABRAMS: The 30-day end to his interim presidency starts counting. Because he’s not in power, that’s the problem. Maduro is still there. So they have decided that they will count that from when he actually is in power and Maduro’s gone. I think it’s logical. QUESTION: So then he really isn’t interim president, then? 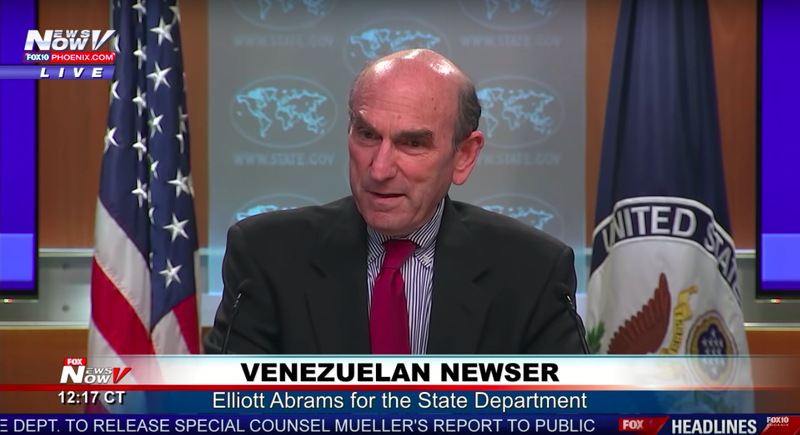 MR ABRAMS: — able to exercise the powers of the office because Maduro still is there. QUESTION: So their interpretation is that until and unless he actually has the power to run the country, he’s not actually the interim president? MR ABRAMS: No. Their interpretation is that the constitution requires a 30-day interim period, but it — those 30 days should not be counted while Maduro is still there exercising the powers of his former office. So to recap, Guaido is still the president of Venezuela after his 30-day window closed because his interim presidency doesn’t currently exist, and because he has no power. By those standards, I’m just as much president of Venezuela as Guaido is. Where’s my meeting with Mike Pence? But of course facts don’t figure into this equation at all, because this is a coup by narrative. As we discussed yesterday, narrative always takes precedence over fact in these games. They will keep referring to Juan the guy as “President Guaido”, despite the admitted fact that he does not actually have any of the powers or recognition that an actual president has, and despite the fact that there is currently a guy in Caracas who does have all those things. They will keep advancing this narrative control war until it either succeeds or fails, and in the case of the latter they’ll change tactics and try something else. The battle for power is the battle to control as many humans as possible, and the battle to control as many humans as possible is the battle to control the stories those humans are telling each other. Humans are storytelling animals, so if you can control the stories you can control the humans. Understand this and you’ll understand the behaviors of governments and media around the world. Thanks for reading! My articles are entirely reader-supported, so if you enjoyed this piece please consider sharing it around, liking me on Facebook, following my antics on Twitter, throwing some money into my hat on Patreon or Paypal, purchasing some of my sweet merchandise, buying my new book Rogue Nation: Psychonautical Adventures With Caitlin Johnstone, or my previous book Woke: A Field Guide for Utopia Preppers. The best way to get around the internet censors and make sure you see the stuff I publish is to subscribe to the mailing list for my website, which will get you an email notification for everything I publish.